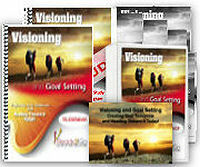 Special Report: Visioning and Goal Setting - Projecting Your Tomorrow and Heading Toward It Today from Ready2Go Marketing Solutions, Inc. There are times in all our lives that we wonder what happened to the hopes and dreams we thought we would have accomplished. We had such high expectations and special visions for our future but somehow, along the path, we accidentally took a wrong turn and got off course. What if there were some very simple, easy-to-follow steps to getting your life back on track? Would you be willing to learn to apply these "time tested" & proven methods? These steps to “Self Creating” your uniquely authentic life are in your grasp! Soon, you too can manifest "A Clearer Vision of That Person in the Mirror! In this Special Report, your clients and prospects can learn how to effectively discover their deepest desires and dreams. 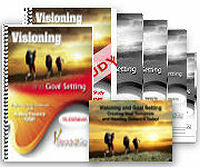 Then they will follow the very simple steps laid out in this Special Report to show them exactly how to manifest those dreams into reality. Once your clients experience the valuable insights and information contained within this article, they will feel empowered to pursue their own life’s vision.